The experience of culture and art belong equally to all. Culture and art education plan “Cultural Path” is a tool designed for teachers. In cultural path a student who is in elementary school will become familiar with different art forms and their own regions culture. Cultural path is a representation of what type of art and/or cultural content that is split by age group to determine what can be provided to different classes. 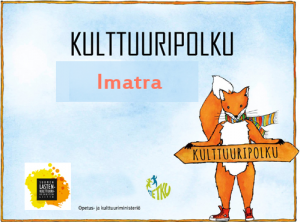 In South-Karelia cultural path is coordinated by Metku. The activities are funded by the Ministry of Education and the Ministry of Culture and municipalities in the area. Check out the Cultural Paths working in Finland’s municipalities. Annually published teacher’s guide presents different opportunities and contacts with the municipal’s cultural and art activities. Luumäki, Ruokolahti, Rautjärvi and Savitaipale are still working on their own cultural pages.